Livinghouse supply contemporary shower columns for surface mounting within a shower. 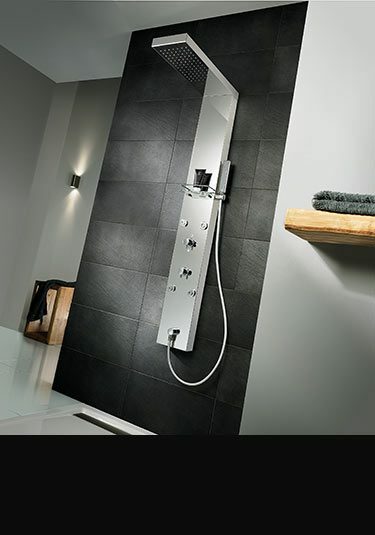 Our wall mounted shower towers are all manufactured in European ensuring great quality. We offer columns made in chrome, stainless steel and glass. These multi-function shower columns can be supplied with large overhead shower heads with a rain function plus an additional handy handheld shower heads with a diverter valve to divert between the two. We also have shower columns with body jets and thermostatic shower control valves to regulate the water temperture and pressure. A contemporary shower column made in Germany in solid brass with a plated chrome finish. This shower column is thermostatically controlled operating a handheld shower head and a large 250mm rain drench head. 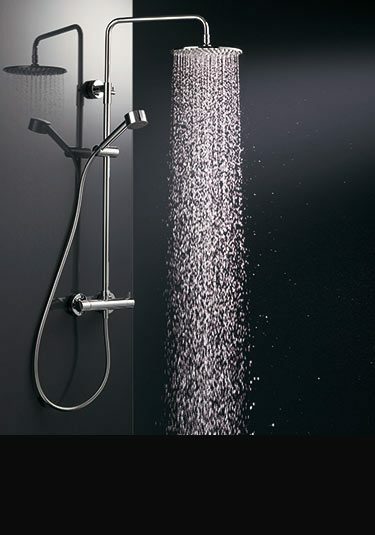 A multi-function shower column that is thermostatically controlled. 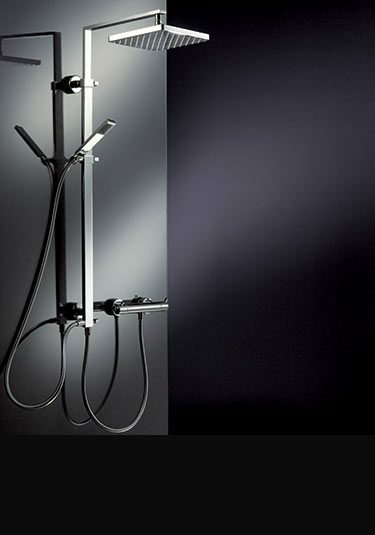 This shower is cubic in styling and is high quality German manufactured in solid brass with a chrome finish. Multi-function shower column which is operated by a separate thermostat control. 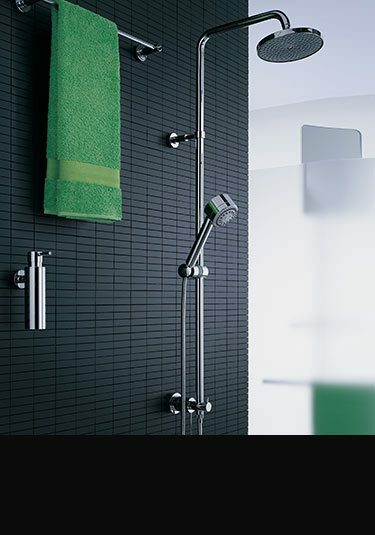 This surface mounted shower is German made ensuring quality and longevity. Impressive freestanding shower column finished in brushed stainless steel and with a coloured tap handle choice between 8 colour finishes. This floor standing shower tower is the latest in Italian styling and makes a great design feature within luxury and designer bathrooms. 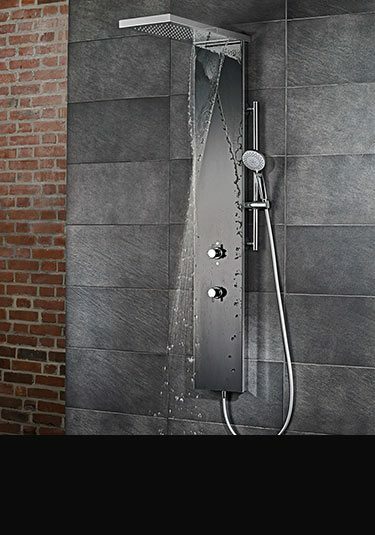 A square tubed multi-function shower column has a large 250mm overhead rain shower with a adjustable handheld all operated via a lockeable thermostic control valve. Made in Germany in solid brass with a chrome finish. Impressive electronic shower column with touch and sensor controls. Supplied with illuminated control icons on black or white glass. Latest European technology and very reliable. 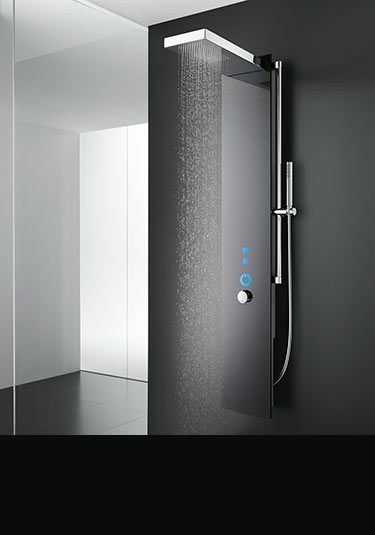 Luxury electronic shower column with touch, sensor and digital controls. This designer thermostatic shower column has 3 showering functions which can be selected via the illuminated control icons and the digital thermostat. Supplied in black or white glass and uses the latest European technology which is very reliable. 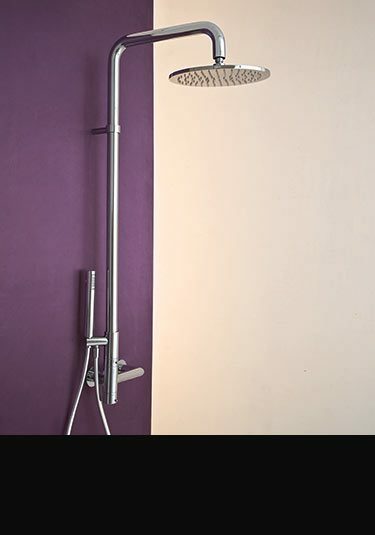 High European quality this designer shower column is thermostatically controlled with a large rain shower head and a handy handheld shower. Lovely contemporary styling. 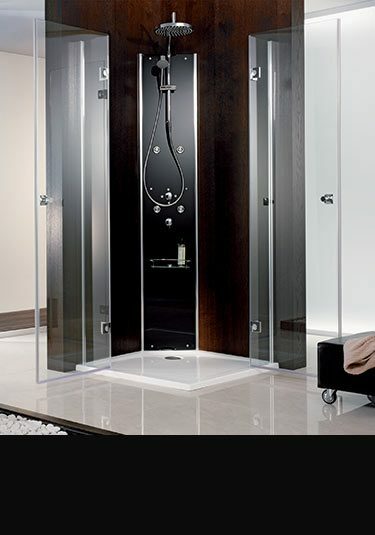 German made multi-function shower tower for corner installation. 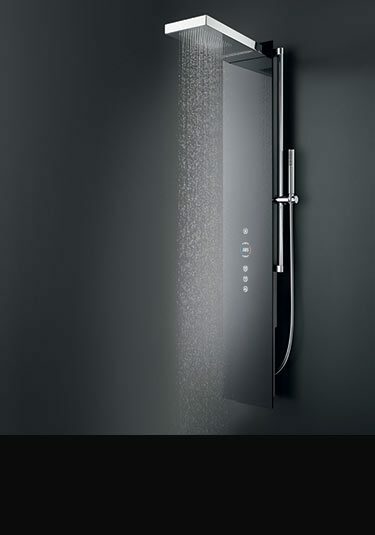 Each shower column is black glass fronted and has a large drench shower head, an adjustable handheld shower and body jets, all allowing luxury showering through a thermostatic control. 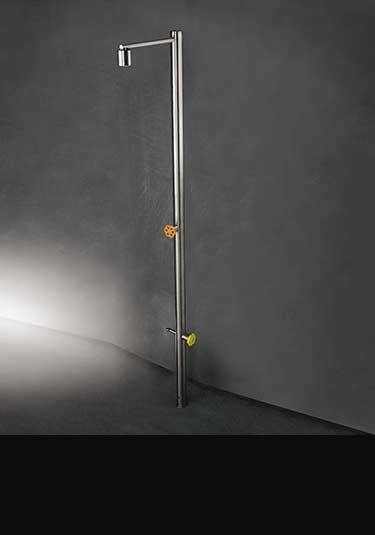 Impressive German manufactured shower column available in polished stainless steel or a black glass version. Each shower tower has a dual function overhead shower head with rain and waterfall spray patterns and a handy handheld shower head, with both operating via a 3 way thermostatic control valve. Italian made shower column in chrome. 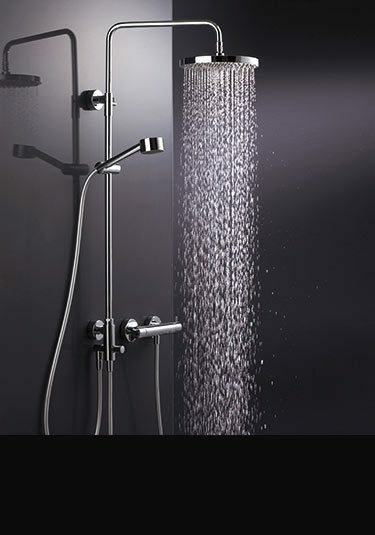 This contemporary multi-function shower has a large overhead rain shower plus a handy handheld shower. 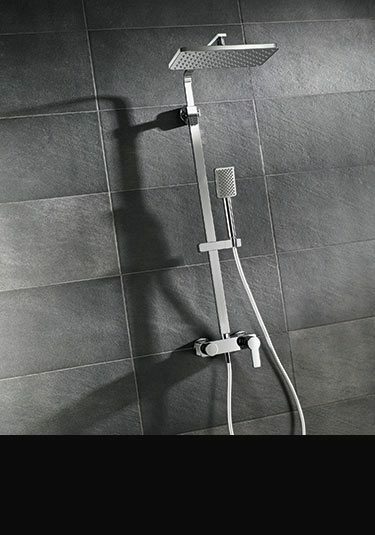 A cubic multi function shower column made and designed in Germany. With its chrome on solid brass construction this shower tower is high quality and built to last. A separate thermostatic control is available as an optional extra.